Vermont Works for Women’s (VWW) flagship event, Women Can Do (WCD), celebrates its 20th anniversary this October 11 at Vermont Technical Center in Randolph! 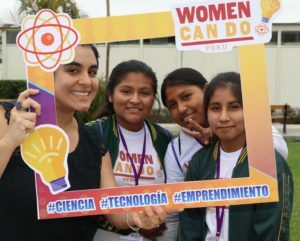 Therefore, it was timely and unique that we had the opportunity to partner with APIE (Asociacion Peruana Empresarial) in Lima, Peru to bring this event and the opportunities it offers to young women across borders, and to spread our mission and goals far and wide. WCD Peru took place on June 9th, 2018 at the Pontifica Unversidad Catolica Peru in Lima, Peru. 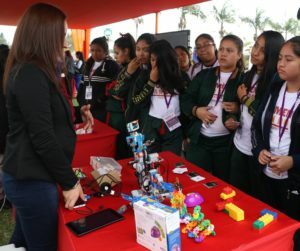 The event empowered 58 girls, ages 13-15, from public schools in Callao, a district of Lima where social problems that disproportionately affect women, such as crime, drugs, poverty and teen pregnancy, are prevalent. Similar to our local Women Can Do event, the aim of this conference was to provide opportunities for these young women to expand their horizons about what is possible for them for careers and education, and to empower them and build their confidence in themselves. The focus was on activities or professions that are non-traditional for women, such as entrepreneurship, engineering, innovation, and technology. I visited Peru from June 2-June 14 to support the event with my knowledge and experience of running WCD. I had the privilege of personally visiting each of the schools to help with the selection process of the participants, which was by far a highlight of my experience! Each school received us with a warm welcome and the young women were so curious, excited and grateful for the opportunity to participate in the event. Most of them had not had an opportunity like this before. At these visits, students shared their hopes, dreams and motivation for participating, as well as why they think opportunities like this are important for young women. The event itself was a huge success! Participants heard from influential women speakers in entrepreneurship, technology and science fields. They had the chance to visit the 3D printing, robotics and virtual reality laboratories at the university to participate in activities and learn more about what they do there. They also attended workshops in biology, robotics, and geography. Lastly, there was a mini-expo where social organizations and public institutions provided resources and information about scholarships, innovation, science, entrepreneurship and more. While in Peru as a VWW representative, I also visited and presented about VWW’s work and mission at a variety of private and public institutions, including the Universidad Mayor de San Marcos (UNMSM), and Muninet, a program of the municipality of Lima that offers accessible and low-cost classes in computers and technology. The Biblioteca Nacional del Perú arranged for me to offer an inspiring and motivational presentation about women in non-traditional careers to young women at the Republica de Panamá school. Lastly, I participated on a panel called Women in Entrepreneurship at the Pontificia Universidad Católica del Perú to discuss women’s roles in business and entrepreneurship, and obstacles women are still facing in Peruvian and American society today. 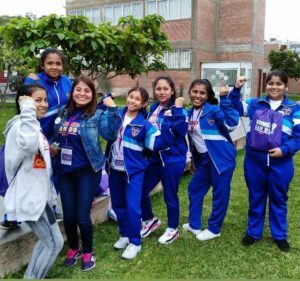 WCD Peru provided a unique opportunity for young women from Callao to expand their horizons, discover a passion they never knew they had, and reconsider their preconceptions of what is possible—for themselves and for women in general. This experience was rich and rewarding. I was extremely proud to bring the meaningful and rewarding WCD program to students in Peru who would not have had such an opportunity otherwise. The last activity of the WCD Peru event was to have the girls sit in circles with an adult mentor and discuss how the event had influenced them. After a discussion, each girl had the opportunity to write her dreams on a piece of paper and post it on a large bulletin board. During these conversations, many girls expressed that they had changed their idea of what they want to do for their future based on what they learned at the event. Here’s to 20 more years, a lasting impact on young women…and maybe a few more adventures for Women Can Do! Yes, I want to support programs like Women Can Do!